MADSION — Whenever FCIAC power Darien and SCC power Hand get together, strong defensive efforts from both teams usually is a given. The Blue Wave and Tigers took it to another level on Saturday. Hand goalie Kylie Gargiulo had eight saves and the Tigers forced the Blue Wave to go 0-for-12 on penalty corners, while Darien goalie Erica Blaze had five saves, including on a penalty stroke, as the teams played to a scoreless tie at Hand High. “Our teams played other defensive games like this in the past, and I think we actually beat Darien once before, but traditionally when we play, Darien comes away with two or three goals,” Leckey said. “This was a great defensive effort with great goaltending by both teams. 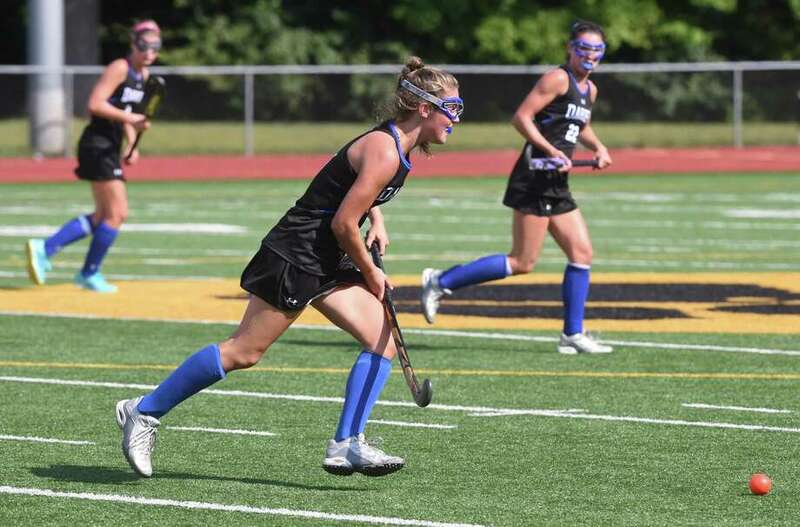 Darien entered the game 3-0 and had outscored their three opponents 22-0, but Blue Wave coach Mo Minicus viewed the game as her team’s first big test of the season. “I’m exhausted,” Minicus said. “Hand’s defense was a wall back there. I was excited to play this game because I knew it would be a challenge and give us a barometer of where our team’s development was at this stage. One of the Blue Wave’s best chances to score came with 22:30 to go in the second half. Gargiulo made a shoulder-high save off a rising shot from Darien’s Shea Van den Broek. “This was a very hard game, but I try to stay positive and I knew in my mind I was capable of having a performance like I did today,” Gargiulo said. “I just needed to stay in that mindset. I was focused the whole game and that’s what helped me make the save off that rising shot. Hand (2-0-1) was presented with the best opportunity to come away with a win when the Tigers were awarded a penalty stroke with 1:20 left in regulation. Hand was putting pressure on Blaze. A Darien player tried to clear the ball, but it hit a defender high in front of the Darien goal. Taylor Leckey, Sue Leckey’s daughter, took the penalty shot. She sent the ball toward the right post but Blaze was there for the kick save to preserve the tie.